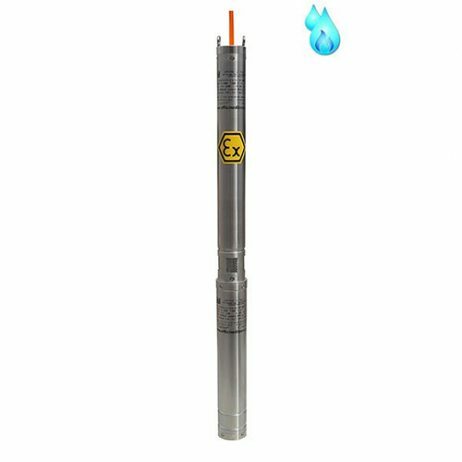 Pumping of liquids in landfill, drainage of liquids from piezometric wells, sampling of fluids in contaminated sites and groundwater. The ATEX pumps in conformity with 2014/34/UE Directive can be installed in potentially explosive atmospheres according to the marking explained hereafter. • Multistage centrifugal electric submersible pumps for 3” wells. • External pump case, delivery port, suction port, shaft and other components in AISI 316 stainless steel. • Impellers and diffusers in special technopolymer. • Available the version for permanent immersion in hydrocarbons (ID EX series). • Available the version with Maxifilter 90 or with Slope Riser. • 2 poles asynchronous motor, 50 Hz, 2850 rpm. • TPE-E 4G1,5 composed cable.